We are internationally recognized as one of the world's leading producers of terry towels. We operate under a vertical business model, which begins with the purchase of yarn and ends with the delivery of the final product. We are based in the city of Vizela, northern Portugal, and we export 98% of all our production. We have more than 600 employees who work with great professionalism every day to get the final product to more than 45 countries. We have been investing in research, development and design ever since the Company was founded, in 1975, and can offer a portfolio of products and services with high added value. We thus anticipate the trends of the most demanding markets, meeting the expectations of all our customers and partners. We are a company with a clear strategic business focus and we stand out for our profile of quality, service, design and innovation. To strive, every day, to retain worldwide recognition. We want to continue to be leaders in the production of terry towels, developing our business sustainably to ensure that our customers are completely satisfied, that we appreciate our employees and that we contribute to the development of the community to which we belong. Integrity: Our employees are deeply committed to the company's ethical code. All the relationships established are based on trust and the assurance of strict fulfilment of what has been promised. Quality: We use the finest raw materials, equipment, processes and human resources in the development, production and distribution of our products. Social and environmental responsibility: We go above and beyond all legal obligations and are certified by the highest standards of social conduct and environmental responsibility. We set out to adopt behaviours and attitudes that help to improve society in general, as well as the neighbouring communities. Innovation: We enhance the value of our offer through a dedicated R&D department and a network of innovation partnerships, which allow us to constantly focus on innovative, sustainable and differentiating solutions. Commitment to the customer: We commit ourselves to planning, managing and executing all the projects with the utmost rigour and precision, throughout the value chain, thereby meeting and exceeding the expectations of our customers. This is regarded as one of the greatest assets of Mundotêxtil. First, because of its innovative and creative capacity, and second, because it is essential to secure an integrated offer for the market, to achieve a close relationship with our customers. Given the high standards our customers expect, we are ready to match the current market with high value-added articles. We have 103 looms, which provide a production capacity of approximately 500 tonnes/month. 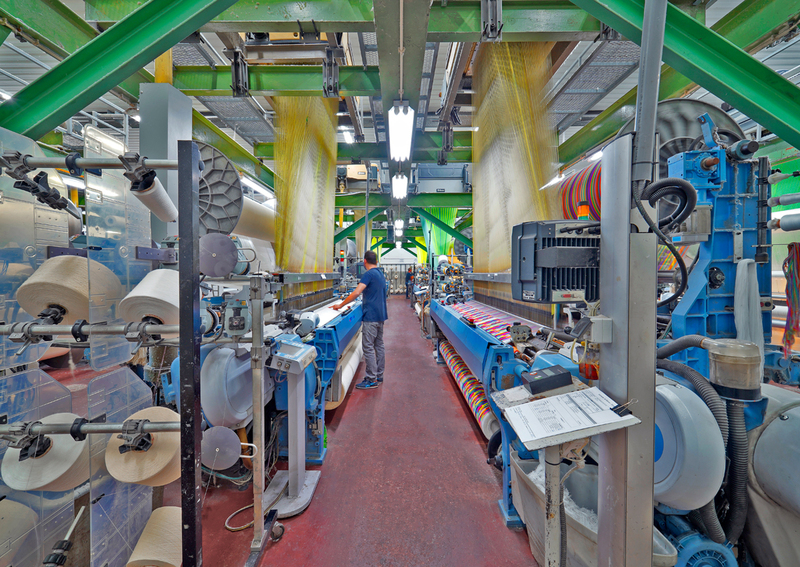 With an installed capacity of around 100 tonnes/month, the yarn dyeing uses technological equipment that ensures the quality of the raw material we use. Our processes of dyeing are governed and guided by the highest and most rigorous quality standards. Equipped with advanced technology machines to dye articles, with an installed capacity of 500 tonnes/month. The permanent study of processes and the introduction of innovative products mean that we can match the dyeing processes with the values and mission of the Company. Recent and ongoing investment have made Mundotêxtil more flexible in terms of manufacture of the end product and have enabled it to respond to the diverse requirements of all its customers. The articles are 100% inspected, folded and packed according to the customer’s demands, ensuring the required level of quality. Our finished product warehouse covers an area of 7,350 m2 and can store 5,300 pallets. Every month we handle 96,000 cartons, 4,800 pallets and 145 trucks, for export. Mundotêxtil’s laboratories constantly investigate new processes that can produce distinctive advantages to the terry. It permanently accompanies the production and ensures the fulfillment of the demanding quality parameters during the production process and in the final product.